Home » Bayani » History » Philippine Hero » Philippines » Pinoy brain » Pinoy Trivia » Who is the "Hero of Tirad Pass"? » Who is the "Hero of Tirad Pass"? One of the most romantic figures in the Philippine History, the youngest general in the Revolutionary Army, A story book hero, He was born in San Jose, Bulacan, on November 14, 1875. He is remembered as the "Hero of Tirad Pass." In this historic place, the young generalfought and held back the strong invading Americans with only a handful of men, thus giving Aguinaldo ample time to escape the conquerors. It was a one sided battle, but Gregorio del Pilar fought bravely. And he paid for his heroism with his life. 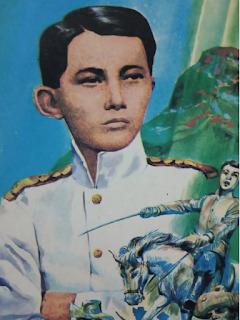 He was shot and killed that fateful day - December 2, 1899, commanding Aguinaldo's rearguard. Before he died, he wrote, "I am surrounded by fearful odds that will over come me and my gallant men, but I am pleased to die fighting for my beloved country." the Americans themselves could not help admiring the young general. They called him an "Officer and a Genteleman."